There are some things in life that should be left to professionals: hair highlighting, hair removal, electrical work, and installing ceiling fans. Or at least in my world those things should be left to professionals. I should really add "making cocktails" to that list. David and the girls are gone for about 24 hours to visit David's mom (I'm crazy busy at work and couldn't go) and I am by myself for a night and a day. After working late tonight, I arrived home to discover I had no prosecco in the house with which to celebrate a Friday night. In the Washington Post Express today there was a cute little article on bar carts making a comeback, so I thought I'd try and make myself a sidecar tonight. I prefer a bourbon sidecar rather than a traditional one made with bourbon, so I looked up the recipe in the handy dandy bartending book called "Bartending for Dummies." Well, I didn't have cointreau, only triple sec, and I didn't have any good bourbon, only an off brand. I also didn't have real lemon juice, just lemon juice concentrate. Oh, and I also didn't have a martini glass or a cocktail glass, so I used a high ball glass. I headed down to the basement and collected my vintage highball glass and my vintage cocktail making stuff. I also collected my vintage liquor, bought when we moved into our previous home somewhere around 2000. I followed the directions, chilled my glass properly, and was looking forward to the first sip. Boy was I disappointed when it was disgusting - I shouldn't have been that surprised since I didn't have any of the actual ingredients that the recipe called for, but still ! So I added about 8 oz. of 7 Up, and it was much, much better. It's probably just as well. We don't have room for a bar cart in the dining room anyway. I'll stick to sidecars at restaurants and Prosecco at home ! Ha! My favorite mixed drink is a Mojito but my attempts at making one at home have failed as well. 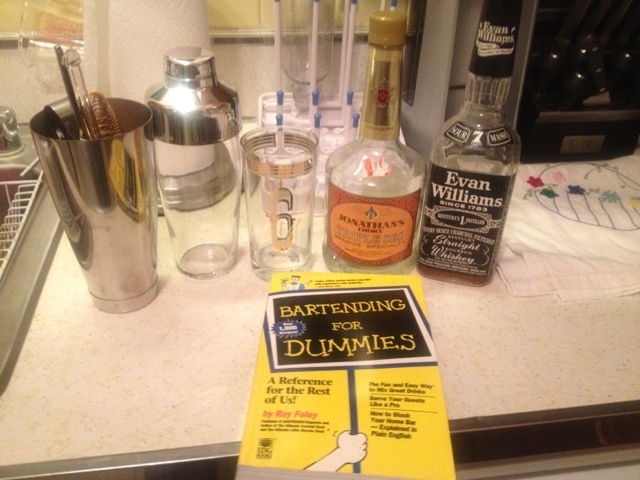 This might be a fun New Year's Resolution or "Life List" task -- Learn to make an excellent (insert favorite drink)! Always have the ingredients of your favorite cocktail at home. That's my motto but are you surprised?